The thought of leaving behind your pet to seek drug or alcohol addiction treatment can be stressful and overwhelming. 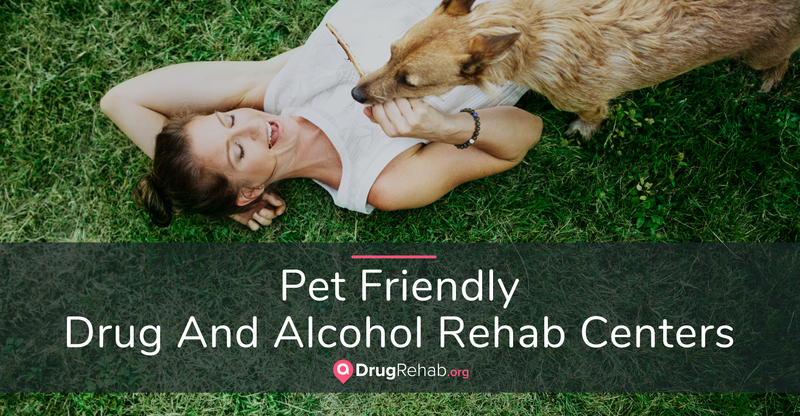 Luckily, there are many pet friendly drug and alcohol rehab centers across the United States that allow patients to bring their pets while receiving treatment for a substance use disorder. A pet-friendly drug rehab center is a treatment facility that allows you to bring your furry friend with you. Seeking treatment is one of the best decisions you can make when living with a substance use disorder, but it can require you to leave your home for an extended period of time. For those with pets, this alone can deter them from receiving the treatment needed to recover from addiction. Pet-friendly drug and alcohol rehab centers have become increasingly popular for this reason. Having your pet with you in treatment can help to keep your spirits high and relieve stress. While finding affordable pet care may seem impossible, finding pet-friendly drug and alcohol rehab centers is not. A growing number of drug and alcohol rehab centers allow you to bring your pets with you while you receive inpatient treatment. Here is a list of the top pet-friendly drug and alcohol addiction treatment facilities based on patient success rates, reviews, and accreditation. Capo By The Sea is a luxurious and pet-friendly treatment facility. They understand how important a pet is to an individual’s overall wellbeing and will make arrangements for your pet or pets to join you while receiving treatment. Capo by the Sea offers a number of different treatment options, including treatment for co-occurring disorders, residential detox programs, and inpatient and outpatient drug and alcohol treatment. A few of the amenities you can enjoy during your stay include private rooms, a golf course, and a beautiful beachfront view. They take an evidence-based and holistic approach to recovery and incorporate many types of treatment into their programs, including cognitive behavioral therapy, medication management, relapse prevention, and equine therapy. Morningside Recovery has pet-friendly facilities that allow clients to bring their pets with them while undergoing inpatient drug and alcohol addiction treatment. Morningside believes that receiving treatment alongside your pet can increase the chances of a successful recovery. This drug and alcohol treatment center provides holistic and individualized treatment for each individual to ensure all of his or her needs are met. Their programs include supervised detox, residential treatment, intensive outpatient programs, and aftercare planning and support. A Step In The Right Direction offers a number of pet friendly drug and alcohol addiction treatment options. Their services include detox programs, partial hospitalization, intensive outpatient programs, and gender-specific luxury sober living. A Step In The Right Direction is a JCAHO- and DHCS-accredited facility and offers specialized care to every patient. This rehab center utilizes evidence-based treatment methods that are individualized and family-based. Alpine Recovery Lodge is a nationally acclaimed drug and alcohol addiction treatment facility that offers individualized care in an intimate setting. Patients here enjoy a peaceful and beautiful setting where they can recover comfortably alongside their pets. Their comprehensive treatment approach centers on emotional, spiritual, and physical healing and relies on the latest therapeutic methods. They also provide programs for dual diagnosis and intervention assistance. Taylor Recovery Houston Sober Living is a pet friendly drug and alcohol addiction treatment facility located on Houston’s east side. Their program offers accountability and structure while allowing patients to enjoy a relaxing and healing environment. Their program of recovery can be adapted to suit each individual’s needs, and they have many different housing options available, including private and semi-private luxury rooms. They also offer intensive outpatient programs (IOP) and aftercare services. Serenity Light Recovery strives to be a beacon of hope and light for their clients. This drug and alcohol addiction treatment facility is located on a gorgeous, all-inclusive campus with 52 beds for residential treatment. This pet-friendly treatment facility is based on a 12-step approach, but it also offers alternative recovery programs to suit the needs of every individual. They incorporate holistic methods to heal the mind, body, and spirit, including meditation, yoga, and massage therapy. Dogs are known as man’s best friend for a reason, and having your companion with you during treatment can provide stress relief and added encouragement to recover. While not every inpatient drug and alcohol treatment center allows dogs, there are many that do, and simply knowing this can provide hope for an individual suffering with addiction. In addition to bringing your own dog with you while attending an inpatient rehab center, there are other options available if you are unable to bring your dog or don’t have a pet. Dog-assisted therapy, and pet-assisted therapy in general, has become increasingly popular in drug and alcohol addiction treatment. Also called canine-assisted therapy, this treatment can provide many benefits for patients recovering from a substance use disorder. These benefits include learning how to relate to others, improved mood, a heightened interest in therapy overall, and more motivation to recover. Behavioral Health of the Palm Beaches, located in Palm Beach, Florida, uses canine-assisted therapy in their drug and alcohol rehabilitation programs. Their program aims to give patients warmth, affection, and joy during their inpatient stay, and helps patients progress more quickly through their treatment program. Like dogs, cats are deeply loved and cared for by their owners. Being able to bring your cat with you while you attend an inpatient drug and alcohol addiction treatment program can provide stress-relief as well as happiness and support throughout your stay. Plus, being able to bring your pet to a rehab facility will alleviate the stress that comes with having to find and pay for boarding your cat while you’re away. Some treatment centers may not allow an individual to bring his or her own pet, but provide pet therapy programs that still allow patients to spend time with cats or dogs. Additionally, some drug and alcohol addiction treatment facilities may allow an individual to bring his or her cat to treatment, but limit the time allowed to be spent with the pet. Every treatment facility is different, so it’s important to call ahead before bringing your cat with you. Broadway Treatment Center in Huntington Beach, California, is a pet-friendly rehab facility that encourages clients to bring their pets with them to treatment. They believe that pets provide reassurance and a sense of responsibility for patients and can keep a person’s spirits lifted throughout treatment. Having to board your pet while you are in treatment can often be costly, and asking friends or family can feel like a burden. Bringing your pet with you to a rehab facility eliminates this stress. What’s more, many studies have shown that having a pet during drug and alcohol treatment can reduce depression and anxiety as well as other symptoms of mental health disorders. A pet can also give you an improved sense of well-being and act as a motivator to get and stay sober. Researching pet-friendly drug and alcohol rehab facilities is the first step to choosing the best treatment center for you or a loved one. Calling ahead and inquiring about whether a facility allows patients to bring their pets can help narrow down your search and avoid any misunderstandings. If you don’t have a pet but are interested in attending a facility that offers pet-assisted therapy, this is an option to inquire about as well. For more information on finding a pet- friendly drug rehab center, contact us today.